This is from my first Otakon photo shoot – the one I mentioned before in which I had no idea Otakon was even going on until we arrived in Baltimore. He was one of three people I photographed. Why? Because, even though I’d never watched it, I actually knew what InuYasha was. InuYasha is a manga/anime by Rumiko Takahashi, the creator or Ranma ½. Because manga artists tend to have a very recognizable style, I knew it was by her just from the character designs. The main characters look like Ranma and Akane. The anime was very popular for a few years while it was playing on Cartoon Network’s Adult Swim. This popularity might be why this photo took the top spot away from my Reflections of Love photos a year after it was posted with 4000 views. Three months later it had 5000 views. And now, five years after taking that photo, it has 11,813 views. It may not be my most artistic photo or my favorite, but the fact that so many people have decided to take a look at it makes me so happy. After all, what’s the point of unseen photos? It’s been awesome working on this project. I’ve rediscovered photos I’d forgotten taking. And I’ve relived a few memories. I wrote all of these blog posts throughout February and the first day of March so that I could make sure to finish it all while I still had the motivation. I also wanted to have it queued up so that a vacation or some other event in my life wouldn’t interrupt the process. So when this photo is finally posted, nearly half a year after I write this, I’ll probably work on a quick little post on what’s changed in the Top 200. Probably focusing on the number of views required to be #200 and any changes to the photos in the Top 20 slots. Dude it’s been amazing that my photo has had this long of a run at your #1 spot. 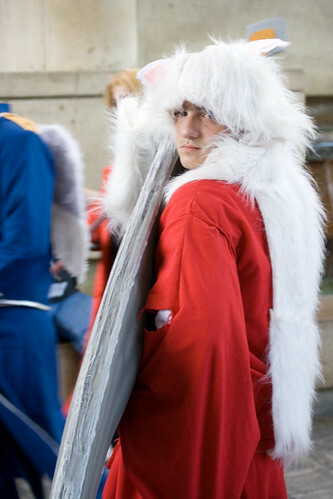 It has been years since I’ve cosplayed as InuYasha and never really realized how popular that cosplay was. I need to fix it up and bring it back again. However, my back is about 6 years older now and those sit commands may not agree with me. lol. Well if you have seen me at other conventions, I have cosplayed as Kamina from Gurren Lagann, Black Star from Soul Eater, Renji Abarai from Bleach just to name a few. Well thanks and I’m glad I could stumble across your page. I’ll be sure to keep checking back.